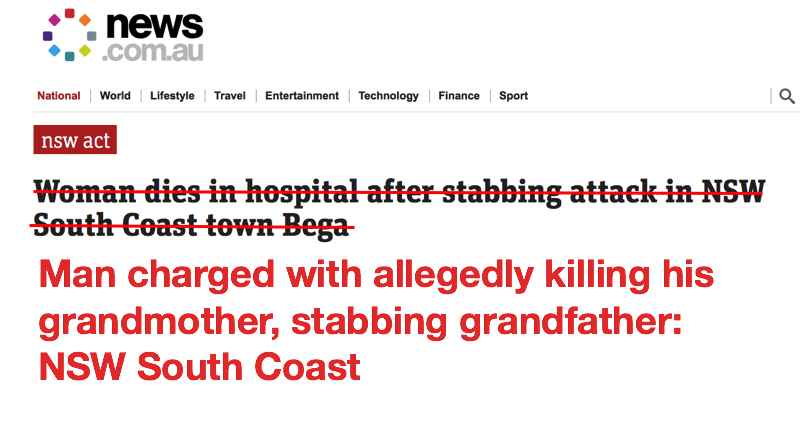 News.com.au reported that 20-year-old Murray Deakin was charged with allegedly stabbing his grandmother to death and stabbing his grandfather and assaulting another man during his attempt to escape police. The article gives a detailed account of police description of the events leading up to and after the stabbing. Almost all of it is about Deakin’s actions and possible motivations for the alleged murder and assaults. Despite this, Deakin himself is completely absent from the headline.